The club has introduced many owners of cruisers (and cruiser/racers) to the fun and competition of yacht racing. 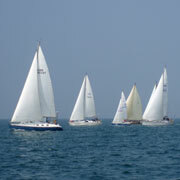 Club members race a wide range of cruiser types (all monohulls) and sizes; with differing levels of equipment and ages of hull. Full and friendly assistance is offered to those new to cruiser racing and we all learn from each other and from gaining experience for future races – or just getting from place to place faster. We have also held presentations and promoted short courses on topics such as Starting Procedures and Race Management. Many CCRC members take part for no better reason than the fun of it, while others also compete at the highest levels with notable successes in RORC races, Cowes Week, Cork Week, the IRC Nationals and ISC Round-the-Island. Potential members can take advantage of racing as a guest yacht for a trial race or just race with someone else for the experience.